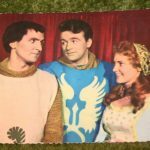 This 30 episode series followed the adventures of Sir Lancelot, famed knight of the round table. Played in this series by William Russell, who would later become one of Doctor Who’s first companions. It followed in the style of many other of the ITC shows of the period. Sir Lancelot mostly having to stave off threats to the throne by marauding invaders.